If you’re an expectant mother trying to put together the perfect birth plan, one of the biggest names in oral hygiene has a new initiative you might find interesting: Listerine is asking anyone who intends to clean the viscera off their newborn baby in a bucket of mouthwash to choose Listerine. Wow! If it turns out there are people who are set on washing a newborn in a bucket of antiseptic mouthwash, Listerine is definitely gonna have the market cornered. 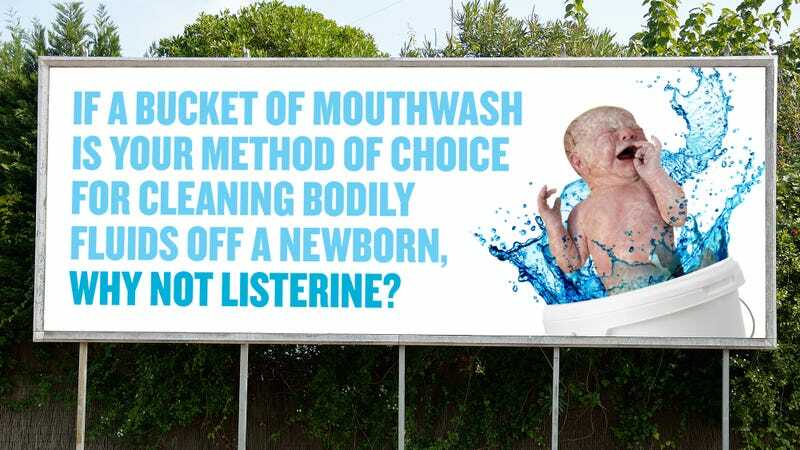 Listerine delivered the announcement via a series of new ads this week, all of which plead Listerine’s case for why its product would be the superior choice for people currently planning on sterilizing their newborns in buckets with mouthwash. Many of the ads boast that Listerine is the best oral hygiene product on the market for washing amniotic fluid off of infants, noting that competitors like Colgate haven’t even considered such an application for their products and therefore just aren’t brands that new moms can trust. Listerine also issued a statement this morning making an emotional appeal to expectant mothers to give their mouthwash a try. This is a bold marketing play for a company primarily associated with keeping mouths clean, but if it works out, you can expect other mouthwash companies to follow suit with newborn-sterilization initiatives of their own. Whatever happens, this is nonetheless an exciting development for soon-to-be moms who want their newborns to start off life clean, minty, and in a bucket.